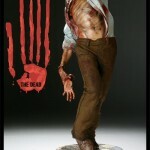 Sideshow Collectibles has announced their first zombie Premium Format Figure. Titled Patient Zero, the figure is listed for $279.99 and ships 2nd Quarter 2009. Own the first of the infected that started Zombigeddon by placing your Pre-Order for Sideshow Collectibles’ Exclusive Patient Zero Premium Format Figure, which includes an alternate hand accessory. With an edition size of only 100 pieces worldwide, we don’t believe he’ll be shuffling around for very long! If you happen to miss out on acquiring the very limited Exclusive Edition of this collectible, a Regular Edition is available for Pre-Order right now! Remember to use our FLEXPay option when placing your order if you’re looking to keep your bank account out of a dead zone! 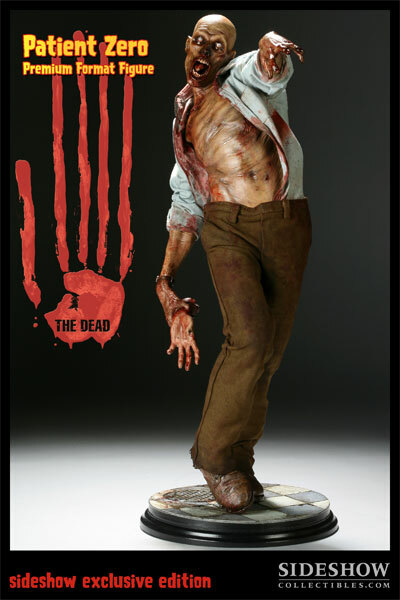 Sideshow Collectibles proudly presents the Sideshow Original, Patient Zero Premium Format figure from The Dead collection. Lumbering from his hiding place, Patient Zero reaches for an unseen target. His contorted face gives a haunting picture of The Dead, jaw open in a silent scream, eyes milky and glazed with death. This icon of The Dead’s origin stands nearly eighteen inches high atop a mysterious environmental display base, dressed in a real fabric costume, stained by the blood of his victims. The Patient Zero Premium Format figure is an outstanding addition to any display. You can pr-order the figure Here.